Women all over the world are finding respect, satisfaction, value and the necessity to take on leadership roles at work. The nurturing nature of women is something that workplaces require and what employees respond to. Women have been historically recognized as the nurturers and caregivers of the family unit. When this is extended to the workplace, women can be the catalyst for working together harmoniously rather than being pitted against one another. The misconception is that women need to be identical to men with regard to leadership styles but in reality it is the essence of a woman that is needed in today's work environment to function as a whole to one common profitable end. Striking a balance between being true to one's femininity and being assertive is something that could propel a woman's leadership capabilities. The misconception is that being womanly is equivalent to being meek and docile and if a woman were to be assertive she would go against the very nature of who she is. Being assertiveness is a crucial aspect of effective communication as a leader and more so for women. Women forget to be assertive in the workplace and tend to retreat into silence when faced with a difficult employee or situation as they could be used to this pattern of functioning at home. At work if a woman does not learn to speak up and talk confidently about what she believes in, it would be difficult to gain the respect and confidence of her colleagues. It's very important for women to realize that her ideas, opinions and viewpoints are as important as anyone else's. Assertiveness is being confident about oneself and respecting the opinions and viewpoints of others. Another aspect that hinders the growth of a woman is the belief that if a woman would like to excel at her career, she would have to give up family life. There seems to be this choice that has to be made when a woman holds tenure and reaches a certain level of seniority. Some women decide to back out of leadership roles during major life transitions, fearing that it might jeopardize family life. Indra Nooyi, CEO Pepsico, one of the most powerful women in the world, when asked whether it is tough being a mother and a corporate executive, admits that it is difficult, but with a supportive spouse she manages very well. She says, "There are times when the stress is so incredible between office and home- trying to be a wife, mother, daughter-in-law and corporate executive. "Then you close your eyes and think about a temple like Tirupati, and suddenly you feel ‘Hey-I can take on the world.'" Indra Nooyi has accepted the difficulties and challenges of running a family and being a corporate leader and with the support of her family and the faith in her religion it brings her strength and motivation to succeed. At the end of the day she feels accomplished knowing she has given her best to both family and work. We can all learn from Indra Nooyi that through faith in our own sources of strength and serenity we will make time for what we believe is truly important. 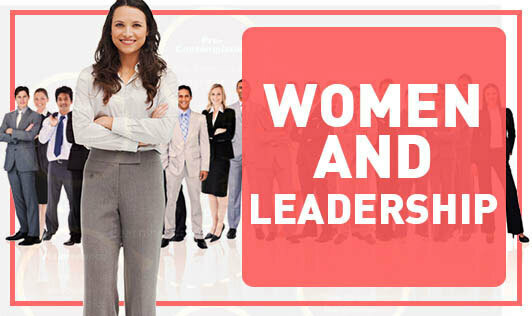 Following are a few ways that a woman can be at a senior leadership position and at the same time nurture and care for a family. • Participate in laying the foundation of your unique family unit... It is from the same solid base from where your children flourish that a wife and a mother can go out and achieve her goals as well. • Don't be afraid to seek tertiary support such as child care support. In order for a woman to be a good leader it is important that she is also a visionary and can foresee achievable future goals that would benefit her team and the company at large. This would be accomplished through confidence in her own direction and ideas and the persistence and earnestness to see it through to the end. It is the ability to manage a family that every woman must call upon even at work because it is the unique positive influence a home maker has that would be very effective at work as well. It is time for every woman to embrace her womanhood and her immense capabilities at the workplace; a combination of which would be a major component of corporate growth and expansion.